Ayurveda translates to the science of life in Sanskrit. Its roots are intimately intertwined with its’ sister science, Yoga. The two sciences have been practiced for over 5,000 years in India. Ayurveda & Yoga are two faces of the same coin. Ayurveda is an elementally based science that serves as a guide to allow us to gain a deeper understanding of our individual makeup. It does so by honing in on the inherent elemental qualities that govern all of creation. By integrating nutrition, herbal medicine, yoga, meditation, rejuvenating and detox therapies, we begin making lifestyle choices that are aligned with our elemental make up. As we step into this remembrance of our true nature as spirit, we are able to create the most optimal environment for self-healing to take place within the body. To develop a plan to bring oneself back into balance. Abhyanga is an Ayurvedic Medicated oil application massage, tailored per Doshic Constitution for detoxification, rejuvenation or pain reduction. Choreographed with specific strokes, 7 – 9oz of warm medicinal oils are poured generously over the body, including coating of the crown of the head. 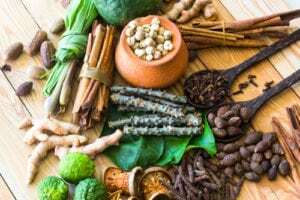 Abhyanga is used to help regulate imbalances, promote relaxation, support deeper mind-body connection, improve blood circulation and eliminate impurities from the body. *Can be added in conjunction with other therapies in Panchakarma programs. Shirodhara is an Ayurvedic treatment where 1/2cup of warm medicinal oil is poured over the forehead in a slow downward stream, coating the crown of the head. This therapy calms the nervous system, improves quality of rest, reduces stress, supports and facilitates a meditative state of mind and creates deeper connection with our Third Eye Chakra. Rejuvenate, restore and reconnect with your inner being. Dive into a healing experience custom tailored just for you. Receive a mini- consult prior to treatment that will help in assessing any current imbalances and/or injuries to structure your journey as blissful as can be. *Price points determined upon protocol and route of treatment.